Northern Pintail (Male): Have you seen this bird? The Pintail or Northern Pintail (Anas acuta) is a widely occurring duck which breeds in the northern areas of Europe, Asia and North America. The Northern Pintail has a large range, estimated at 10 million square kilometers. This is a fairly large duck, with a long pointed tail that gives rise to the species’ English and scientific names. Adult male unmistakable in alternate plumage. Females, immature and eclipse-plumage males are similar to many other female ducks but have a distinctive shape: very long-necked, small-headed and pointed-tailed. Note also female’s brown speculum bordered at the rear by white. 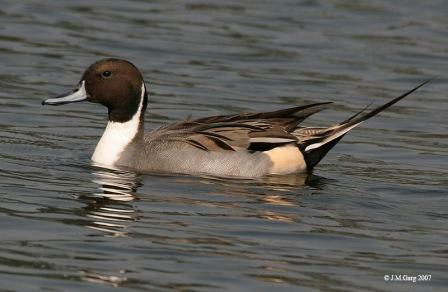 The Northern Pintail lives in open wetlands. It builds it’s nest on the ground, frequently some distance from water. The bird feeds by dabbling for plant food and adds small invertebrates to its diet during the nesting season. The Northern Pintail is highly gregarious when not breeding; forming large mixed flocks with other species of duck. Bird, bird quote, birds, ecstatic mechanism in birds, Ferlinghetti, Lawrence Ferlinghetti, Lawrence Ferlinghetti quote, Lawrence Ferlinghetti quotes, Northern Pintail. Bookmark.